Looking for a strong but flexible wire rope suitable for a wide range of applications? Our 6×12 fibre core galvanized steel wire rope is a high tensile strength cable, ideal for lashing or towing rope and is typically used on cargo ships to tie down and secure loads. Due to being made from galvanized steel, it is ideal for marine conditions and its anti-corrosive properties ensure a guaranteed long lifespan. 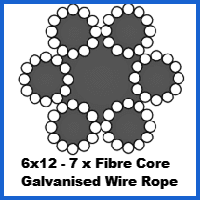 6 x 12 fibre core construction rope contains 6 strands each made up of 12 wires. It’s fibre core gives it added flexibility and a dramatically higher breaking strength than ropes of equivalent measurements (e.g. manila). Other uses for 6 x 12 rope include towboat rope and floating transportation of wood or bundling. As this rope has a breaking force factor of K=0.209 we would not recommend using this rope for heavy lifting, overhead lifting or pulling. You should also avoid using this rope for applications that require high breaking strength and crush resistance. If you have any questions about this product, please give Rope Services Direct a call on 01384 78004. We stock this product in a wide variety of diameters from 3mm up to 16mm depending on your requirements. To discuss these options in more detail or if you’re ready to go ahead and make a purchase, please find a full list of our contact details on our contact page. Alternatively you can fill out the rapid enquiry form attached to our website. 6x12 Fibre Core Galvanized Steel Wire Rope Overall rating: 5 out of 5 based on 6 reviews.